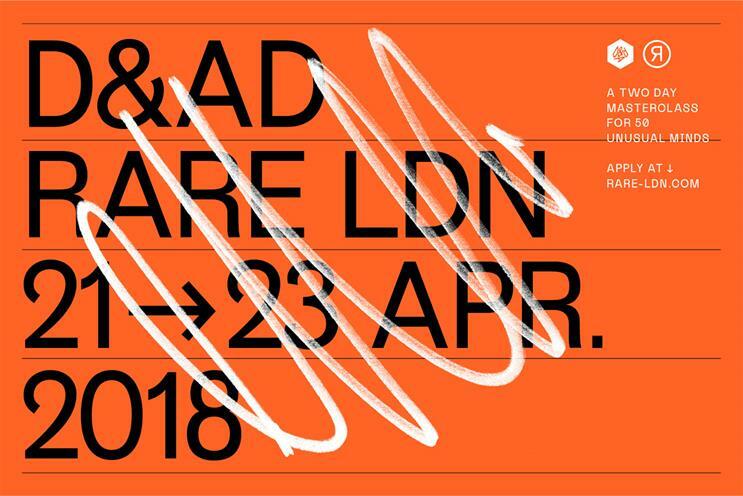 Rare, a masterclass programme, is launching in London this April in a bid to drive diversity in advertising. The programme, created in collaboration with Google, D&AD and the Berlin School of Creative Leadership, is open to all diverse emerging leaders from film, fashion, arts, commercial design, products and services design. This includes in-house and design, brand, UX, creative tech and advertising agency talent. The organisation is not for profit. All proceeds from the course are channelled into activity to support diversity such as internship grants, maternity grants and research. Tim Lindsay, the chief executive of D&AD, said: "The general lack of ethnic and demographic diversity in our business and the appalling lack of gender balance at senior levels in agency creative departments is becoming worse, not better. As our business becomes homogenised, whiter, more middle-class and male, we serve our clients less well and produce homogenised solutions. So, for the future of the business, we need to shift the dial – bring on Rare." Rare was originally the brainchild of Australian founders Stefanie DiGianvincenzo, creative director at Clemenger BBDO, and Tara McKenty, creative director at Google. The programme launched in Sydney last November but has global ambitions. "We saw unconscious bias, as well as feelings of vulnerability and marginalisation, were driving diverse talent out of the industry faster than we can draw them in. Rare equips underrepresented groups with the tools to deal with the issues they uniquely face, while arming them with world-class leadership training – ensuring they stay in the industry and help to lead it," DiGianvincenzo explained. Rare will be taught by some of the industry’s top diverse creative talent who understand the challenges first-hand. The line-up includes Chaka Sobhani, chief creative officer at Leo Burnett; Oliver Percovich, founder and executive director of Skateistan; Jenn Nkiru, award-winning artist and director; Sulaiman Khan, chief executive of ThisAbility; Nishma Robb, head of marketing at Google UK; and Tea Uglow, creative director at Google’s Creative Lab in Sydney. On the last day of Rare, there will be an art auction where all proceeds will go towards funding bursaries for those facing financial or career challenges. The event is supported by Saatchi & Saatchi, 72andSunny, Havas, Sweetshop, Sample, Skateistan, Utopia, Mr President, Google and YouTube. "Diverse media starts with diverse creative leaders. It's those critical director level roles that will change the diversity story for the creative industry, creating role models, lighting up pathways and more importantly, curating creative work that represents the communities we serve. Rare is a game-changer," Robb said. Creative talent looking to apply for the course can apply here.